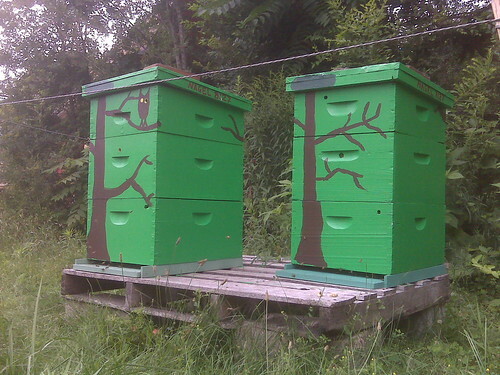 Head-beekeeper, Robby-Bob, came by yesterday and added a shallow super to both hives. Based on the progress that was observed in the last bee post, the hives were past due for some extra expansion room. It took a little while to source the correct size frames for the shallower top boxes, and Robby installed them while I was in class. Ideally the bees will use the new frames mostly for honey that we can later harvest. Robby decided not to use a queen excluder, so there’s the potential that the queen will get up there and lay eggs. We have enough supplies for one more box on each hive depending on how well they take to the new frames.